Let's review the best and the worst fantasy performances through Thursday and Sunday's games so far in Week 8's Fantasy Football Wrap Up. For the first time this season both of the highest scoring quarterbacks of the week played against each other. Russell Wilson was able to have his way with the Texans, throwing for 452 yards, 4 touchdowns and 1 interception. 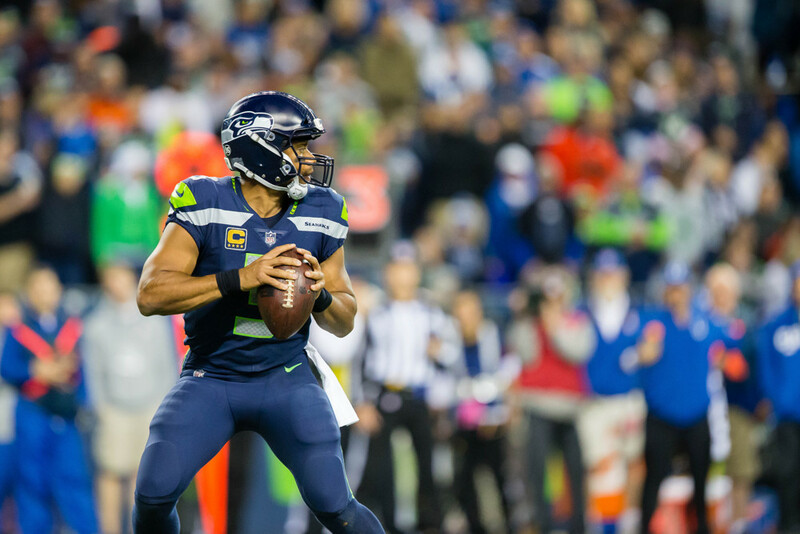 Wilson was also able to run the ball 4 times for 30 yards and finished with 35.10 fantasy points. Deshaun Watson threw for 402 yards and 4 touchdowns, but also threw 3 interceptions. Watson was able to score more than the equivalent of a touchdown as he ran for 67 yards on 8 carries. Watson finished as the second-ranked quarterback of the week and scored 32.80 fantasy points. Jameis Winston did not look good against the Panthers defense this week and failed to throw a touchdown pass. Winston threw for 210 yards and 3 interceptions, and added 13 yards rushing on 3 carries while losing a fumble; Winston finished the week with a laughable 3.70 fantasy points. With the Cowboys focused on feeding Zeke Sunday, Dak Prescott managed the game and ground out the win against the Redskins. Prescott only threw for 143 yards and did not throw a touchdown pass or an interception. Prescott ran for 16 yards on 3 carries and finished with 7.30 fantasy points. The 2 highest-scoring running backs of the week were again LeSean McCoy and Ezekiel Elliott. McCoy had 151 yards on 27 carries and was able to find the end zone. McCoy also caught 6 passes for 22 yards and totaled 29.30 fantasy points. Dallas fed Zeke over and over on Sunday and it paid off - Elliott ran for 150 yards on 33 carries and had 2 touchdowns. Elliott was able to haul in one reception for 4 yards and finished the week as the second-ranked running back with 26.40 fantasy points. Latavius Murray and his owners came back down to reality this week after carrying the ball for 39 yards on 19 carries. Murray was limited in the passing game and only caught 1 pass for 8 yards and totaled 5.70 fantasy points. Devonta Freeman's total upside was severely limited by the role Tevin Coleman played this week. Freeman received 42 yards on 12 carries and caught 1 pass for 20 yards, for a total of 7.10 fantasy points. Freeman was held out of the endzone and watched his teammate out-carry him as Coleman went on to gain 82 yards on 14 carries. While the matchup was enticing, the even-split role in the offense really left owners wanting more. DeAndre Hopkins finishes as the highest scoring wide receiver in Week 8 where he went off against the Seahawks defense. Hopkins caught 8 receptions for 224 yards and scored 1 touchdown, for a total of 36.40 fantasy points. After telling every owner to start him on twitter this past week, JuJu Smith-Schuster delivered in primetime on Sunday night. JuJu hauled in 7 receptions for 193 yards and 1 touchdown, scoring 32.30 fantasy points. In games that scored a lot of points this weekend, both T.Y. Hilton and Dez Bryant had underwhelming performances. Hilton was held in check by the Bengals defense and only had 2 catches for 15 yards, a total of 3.50 fantasy points. Meanwhile, against Josh Norman and the Washington Redskins, Bryant hauled in 4 catches for 39 yards, scoring.7.90 fantasy points on the afternoon. The highest-scoring tight end from this past week was Jack Doyle who caught 12 of his 14 targets for 121 yards and 1 touchdown. Coming into the game the Bengals previously allowed the second-lowest amount of receptions to the position, however Doyle was able to exploit the defense and score 27.80 fantasy points. Jimmy Graham finished Sunday's slate with the 2nd most fantasy points for tight ends with 19.90. Graham scored 2 touchdowns off his only 2 receptions and gained a total of 39 yards. Jordan Reed was heavily involved last week enroute to scoring 26.40 fantasy points - this week he was seldom used and caught his only target for 5 yards. This was a season low in targets for Reed and he finished Week 8 with 1.50 fantasy points. Hunter Henry failed to take advantage against a Patriots defense who, at the time, was giving up the 8th most points to tight ends. Henry had 2 receptions for 11 yards and finished with 3.10 fantasy points. The highest-scoring defense of the week was the Baltimore Ravens Defense annihilated Matt Moore and the Miami Dolphins on Thursday night. The Ravens recorded 2 interceptions which were both returned for defensive touchdowns, 3 sacks and allowed 0 points against and totaled 27.00 points on the week. The second-highest scoring defense this week was the Philadelphia Eagles Defense who had 2 interceptions, one of which was returned for a defensive touchdown, 4 sacks, and a blocked field goal attempt. The Eagles limited the 49ers to 10 points and finished the week scoring 21.00 fantasy points. The highest scoring kicker of the week was Matt Prater who kicked field goals from 19, 34, 37, 48, and 51 yards. Prater finished Week 8 with 18.00 fantasy points. For the third time in as many weeks, Minnesota Vikings' Kai Forbath finished the week as a top 2 kicker. Forbath again missed 1 out of his 2 extra point attempts but was able to kick 4 field goals from 34, 35, 43, and 51 yards out, totaling 16.00 fantasy points.